We speak to the rising indie-pop band about their debut LP & 'Spring' EP. Since debuting with a jumble of self-released tracks in 2017, Wallows has impressed with their oddball blend of distinctly West Coast, (often) retro-leaning alt-rock. The trio, comprised of childhood friends Braeden Lemasters, Cole Preston and Dylan Minnette, then found their musical sensei in producer John Congleton, who encouraged them to be even bolder. That resulted in one of the best EPs of 2018 and, now, one of the best albums of 2019. Nothing Happens (out now) is an all-killer, no-filler collection of tunes that veers wildly into psychedelia, surf-rock and even disco. The fact that it still sounds cohesive is a testament to Wallows’ distinct lyrical aesthetic and preoccupation with relatable themes like alienation, awkwardness and the terrors of growing up. A perfect example is “Are You Bored Yet?” The Clairo-assisted lead single pretty much sums up the dating experience of millennials, while also delivering a sing-along chorus. 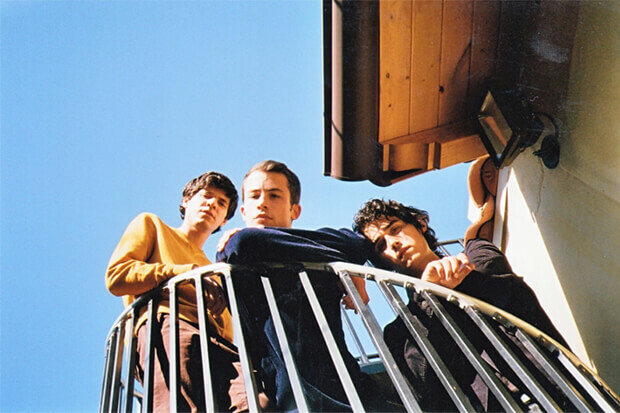 Wallows finds a pleasing middle ground between garage-rock and shoe-gazer haze on gems like “Sidelines,” “Remember When” and “Only Friend.” However, the band is just as successful when they detour into harder rock territory on amazingly-titled anthems like “Treacherous Doctor” and “I’m Full.” And then, there are the more experimental cuts. “Ice Cold Pool” has lashing of disco in its oddball production, while the sprawling (and wonderfully weird) “Do Not Wait” stands out as an instant favorite. Oh, and who could forget “Scrawny?” Arguably the band’s catchiest single to date, this rollicking, fucks-free anthem has taken on a life of its own. And it’s destined to find an even bigger audience with the arrival of the Dillon Dowdell-directed video. It finds Dylan facing off against a much bigger dude in the boxing ring, while Cole and Braeden cheer him on. Watch the soon-to-go viral video and stream Nothing Happens below.